It takes some big stones to cover Rush's Tom Sawyer. 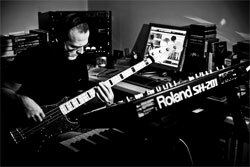 But Italian power prog trio, Canada, headed by Massimo Cillo, seems to be determined. Is their name more than an illusion to that illustrious prog trio? Perhaps. Above, Canada's Massimo Cillo: hard at work. Canada's history dates to the mid-Eighties, and their biography is a tale of woe: miscues, missed opportunties, and misfortunes that can plague any band. 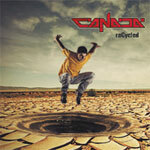 Recycled offers a regenerated Canada offering new recordings of old material; hence, the album title. Musically, this is Eighties and Rush progish melodic rock. The music is the best thing about the band. There's some real talent and creativity here. The first two tracks, Eyes On You and Don't Throw Your Heart, offer geniune prog elements. Angel in the City is more AOR melodic rock. Never Surrender is an instrumental. As mentioned at the start, the Rush cover of Tom Sawyer is the bonus track. Canada gets the basic drift of the song, but it's a malnourished clone. It also betrays Canada's basic weakness, the vocals. You need not expect Cillo to emulate Geddy Lee, but you certainly wish he sounded better, even across the whole album. Canada's Recycled proves the band can offer promising, traditional, melodic progressive rock. They're working on a full album. Let's hope it will offer more, and better material.